Warning: This Picture May Make You Drool.... Tour 9630s! A picture that is worth a thousand words.... aren't they beautiful?! 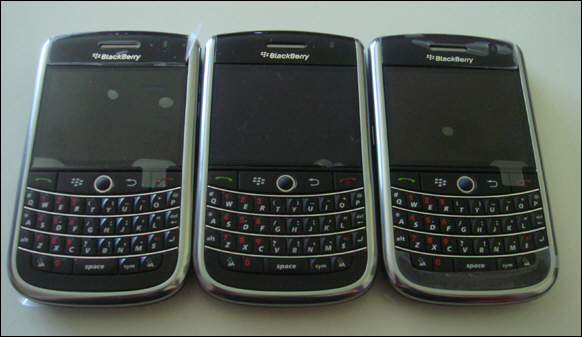 If you haven't read our BlackBerry Tour 9630 review yet, be sure to check out Part I and Part II. Man oh man I can't wait for this device to get released. Yeah, I *wish* it had WiFi and the optical trackpad that the Curve 8520 features (wouldn't it be sweet if they added it in last minute?! ), but regardless it is definitely going to be a hit with the CDMA carriers out there. When the Storm 9530 went on sale, there were lineups at Verizon stores across the USA. Think we'll see the same excitement for the Tour? Anybody reading this planning to stand in line to grab one on day one?